Sometimes a filling will not work, because it would be too large or there is too much damage to the tooth. In cases like those, you’ll need a dental crown. A crown, sometimes called a cap, covers the entire tooth surface. 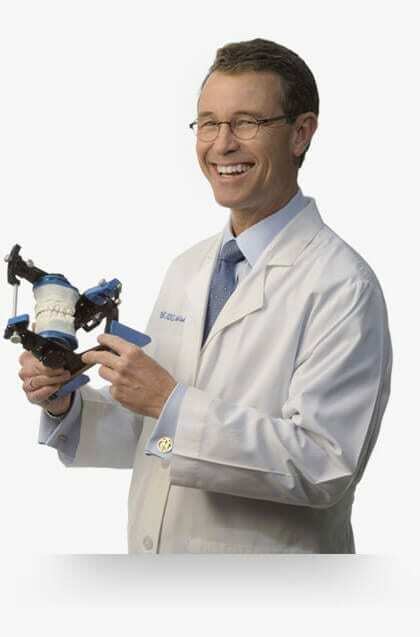 Dr. Arnold will need to shave down your current tooth surface in order to make room for the crown. The crown is then placed over the tooth and bonded into place. 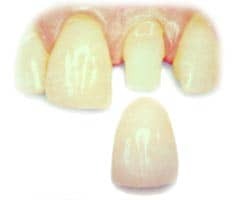 All porcelain absorbs and reflects light the way your natural teeth do. When porcelain has to be placed on a metal foundation, an opaque layer must be placed to mask the metal. This gives it a dull look and takes away from the natural beauty inherent in teeth. Porcelain fused to metal based crowns will eventually develop a dark line at your gumline.This distracts from your smile. All porcelain crowns will never develop a dark line at your gumline. To get an idea of the difference all porcelain can make. Look below at a case done by Dr. Arnold. Jason had two porcelain fused to metal crowns placed on his front teeth. The dark margains were showing at his gumline. 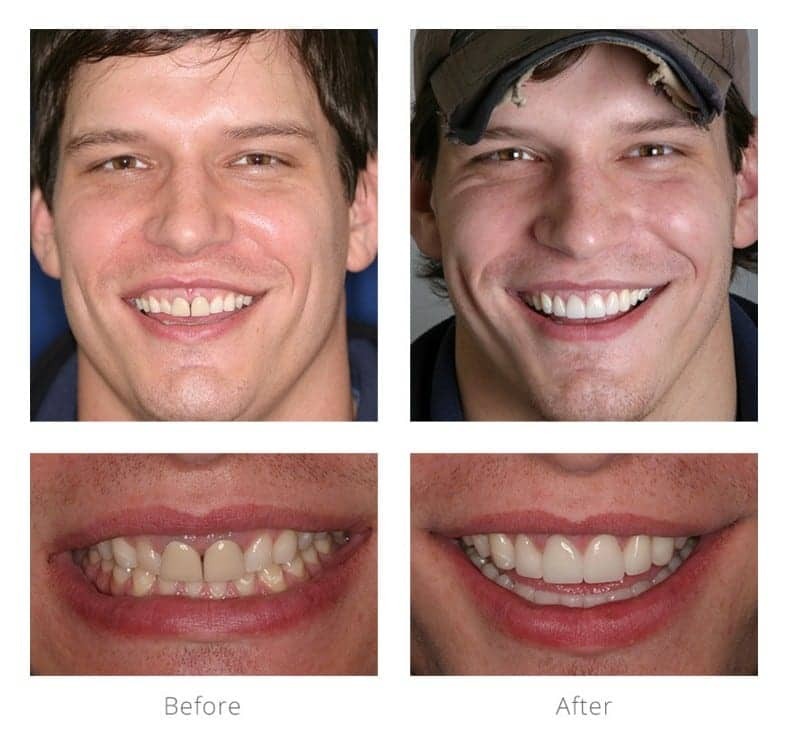 To improve his smile, Dr. Arnold did a gumlift, whitened his teeth, and placed all porcelain crowns on his front teeth. You can immediately see the difference in his two front teeth. Before they were opaque. Now they shine. 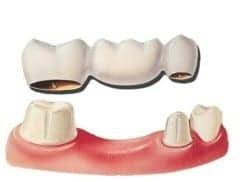 What is a Porcelain Bridge? A dental bridge is used when a tooth is missing. A false tooth will be suspended between two porcelain crowns. The adjacent teeth will be shaved down to make room for the crowns, then the bridge will be bonded on. This treatment makes sense when you have a missing tooth and the adjacent teeth are in need of some work. If the adjacent teeth are healthy, you may not want to shave down their existing structure. In that case, a dental implant would be a better treatment. If you’re needing a crown or bridge, or are looking to replace your old metal based crowns, you are welcome to call our office to schedule an appointment. If you prefer, you may click here to request an appointment online.